Imagine my shock and downright revulsion when I received an email containing a link to the following article, titled New Religious Movement Rising Up Around Podcast of "Harry Potter and The Sacred Text". Yes, you read that correctly ... according to the website Now The End Begins, "hosted by Harvard Divinity School graduates Casper ter Kuile and Vanessa Zoltan, the podcast Harry Potter and the Sacred Text became the number-two podcast in America on iTunes soon after it debuted last summer". And to show you just how deceived our youth have become, consider these thoughts by Mark Kennedy, an impressionable young Millennial. Kennedy grew up a Catholic, and a Harry Potter fanatic. Only one stuck. “I considered myself a non-spiritual person,” he said. He thought he was done with religion. And then he stumbled on the podcast ‘Harry Potter and the Sacred Text.’ The podcast told him that the Harry Potter series — the books that he always turned to for solace when he was angry or stressed or in need of an escape — could be a source of spiritual sustenance. "I feel like I’m born again,” he said. All I could think of was how far we've slid when the oldest non-denominational divinity school in our nation is turning out graduates like Casper and Vanessa, who have tapped into the "spiritual but not religious" mantra of our youth. Seeking to develop a religion out of an obsession with the Harry Potter series of books, Casper ter Kuile and Vanessa Zoltan ask the question, "What if we read the books we love as if they were sacred texts"? Then their mission statement goes on: What would we learn? How might they change us? 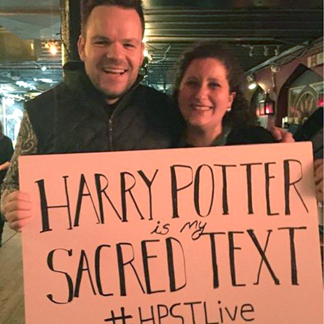 Harry Potter and the Sacred Text is a weekly podcast reading Harry Potter, the best-selling series of all time, as if it was a sacred text. Just as Christians read the Bible, Jews the Torah and Muslims read the Quran, we are embarking on a 199-episode journey (one chapter an episode, to be released weekly) to glean what wisdom and meaning we can make from J.K. Rowling’s beloved novels. We will read Harry Potter, not just as novels, but as instructive and inspirational texts that will teach us about our own lives". But when I looked into the resources for spiritual practice for this absurd "religion", I found articles on various theories of reading for religious purposes, such as lectio divina (a traditional Benedictine practice of scriptural reading, meditation and prayer intended to promote communion with God and to increase the knowledge of God's Word) and havruta (an Aramaic term meaning friendship or companionship and is commonly used to refer to two people studying Jewish texts together). Sadly, the Bible didn't appear as a resource... and this coming from two Harvard Divinity graduate students! I just keep coming back to not only how far this sham has come from real religion, but how far this has come from Harvard Divinity School's original purpose, which was "to perpetuate a learned ministry, in preparation for religious learning and leadership; to ensure that every encouragement be given to the serious, impartial, and unbiased investigation of Christian truth". 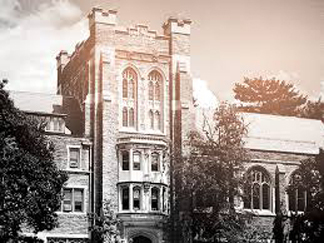 The slide is evident in one of the listed goals of the Divinity School in 2017: to offer significant scholarly expertise in the Christian and other religious traditions. As if to exemplify this new direction, the school magazine writes of a third-year Masters of Divinity student, Abshishek Raman, who rises from his seat and walks to the pulpit. Raman offers a sermon that is conspicuous in a Christian church: Instead of a Bible lesson, he reads from the Bhagavad Gita, using it as a springboard to teach about corporations, social justice, and Super Bowl ads through the lens of Hindu ethics. Unbelievable! In fact, in recent years the Masters of Divinity program has been responsible for the education of all ministerial students at the school, whether they are Buddhist lamas, Christian pastors, or Muslim imams. Dudley C. Rose, associate dean of ministry studies at the Divinity School, oversees the program and says, “I think of creation as God’s gift to itself, and the diversity within it is a part of that gift. When we move to exclude, almost always we’ve seen that we’re on the wrong side of history.” Rose is proud that inclusivity at the Divinity School has allowed the representation of beliefs like Native American religions and humanism and has given queer students and minorities a place on campus. And now Harry Potter and his sacred texts have found a home, too. It all points to the host of new gods that society is willing to embrace. But it greatly saddens me when I see graduates of a Divinity School willing to use the same word to describe the Bible and Harry Potter books. I'm sorry, but in my world of faith, the word sacred has a meaning connoting great respect and reverence [or awe] for the writings of God's Holy Book. I found it deeply disturbing to watch the YouTube video made by the founders of the Harry Potter religion, in which they state that, to them, "sacred is an act, and not a thing -- so you can treat the Bible as sacred; totally legitimate. OR, we think it is more fun and authentic to .... use traditional religious methodology to read Harry Potter as if it was the Bible or the Koran". Are these people serious?!?!? Apparently so, because those who follow them testify that they have been non-spiritual and nebulous when it comes to religion or faith, but have been able to connect to Harry Potter and it's themes on commitment, fear, loneliness, being a stranger, generosity, betrayal, friendship, hope ... and of course, let's not forget the "cross to bear" of this generation.... white privilege. 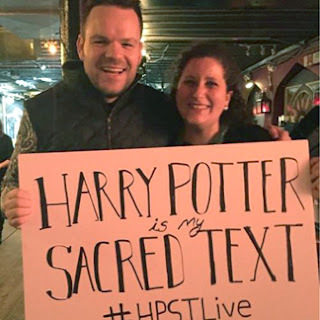 Other testimonies from the Harry Potter "faithful" reveal that they don't come to the sacredness of Harry Potter out of any skepticism [as they do the Bible], but come to it out of a sense of its worthiness. They are a lot more open to Harry Potter, than the Bible, because they know the characters "more intimately". They talk of the joy and the unexpected reflections that come from reading the Harry Potter text; how it speaks to their lives today. One student even gushes that she "felt it in her soul". Others say that reading Harry Potter as a sacred text helps them to live their lives more intentional; that no matter how many times they've read it, they will never "conquer the book" -- there is always more to be revealed. For them, it helps make the world a more inspiring and exciting place to live. Can you see how the devil has distorted the sacredness of the Holy Bible and applied it to a fictional series about a boy wizard? Have we failed this generation so miserably that they are abandoning our churches in favor of this shallow kind of belief system? To compare Harry Potter to the Bible is not only blasphemous, but nearly comical. Yet, you can tell by the declarations of these young people, just how earnest they are in their pursuit of meaning for their lives ... and just how lost they are. And I speak of those Divinity School graduates as much as the vulnerable they are leading astray. But I guess it shouldn't surprise me that we are seeing this kind of absurdity in today's world. What will we see next? Disney World worshipped as the New Jerusalem? 2 Timothy 3:14-15 "But as for you, continue in what you have learned and have firmly believed, knowing from whom you learned it, and how from childhood you have been acquainted with the sacred writings, which are able to make you wise for salvation through faith in Christ Jesus". Wow, creation epic with Harry Potter should be fascinating. Were we all created in a pre Harry paradigm and thrust forward into the future? WTHeck? Oh and then there that interesting little problem of Harry being a fictional character? Satan is doing the deception well. These people sound so dumb Im not sure where we should start witness to them? Do you know the color red? Can you spell "The"? It feels very hopeless. I know what you mean! This generation seems to have been handed over to reprobate minds and seared consciences, which means literally “cauterized”—they have been rendered insensitive and unable to comprehend Truth. Such a mind and conscience does not work properly; it’s as if “spiritual scar tissue” has dulled the sense of right and wrong; deception and Truth. Just as the hide of an animal scarred with a branding iron becomes numb to further pain, so the heart of an individual with a seared conscience is desensitized to God's Truth, and easily led astray by their own imaginations. It is sad, but we have to ask ourselves how were these kids trained up? Obviously not in "the way he should go" (Proverbs 22:6). This is hard to believe. It sounds like a joke but I know you wouldn't bring it to us without running the rabbit hole. What is wrong with these kids who are now adults? What scares me are "what kind of kids will this generation turn out? We had better re double our efforts at bringing these people into Gods Kingdom or were in real trouble. Jesus said they are either with us or against us and in this case we are surrounded by idiocracy turned evil. You can click on the links I've provided in the post to see just a small sample of information on this crazy phenomenon. And it is just another symptom of people following the Prince of this world. He knows just how to tempt them with this generation's "apple".